The Alaskan Malamute is a large and powerful sled dog. They can weigh over 100 lbs and stand up to 30 inches high at the shoulder, though 25 inches high is regarded as the preferred height for freighting. They are an impressive looking dog, quite beautiful and dignified. Because of copyright concerns over the collection of all the Standards at any single site storing all the faqs, AKC Standards are not typically included in the Breed faqs. The reader is referred to the publications at the end of this document or to the National Breed Club for a copy of the Standard. Alaskan Malamutes originated with a group of native Innuits known as the Mahlemiut. The dogs of that time were very large freighting dogs capable of pulling heavy weight in extreme conditions. The Mahlemiut people mainly inhabited the upper part of the Anvik river in Alaska, but were spread over a wide region. The Malamute was used to haul food back to the villages. It was used as a heavy freighting dog, able to pull a tremendous amount of weight over long distances at a steady pace. The gold rush of 1896 created a high demand for these dogs. Today, there are essentially two different “kinds” of Alaskan Malamutes. One line is referred to as the M’Loot and the other is the Kotzebue. One difference between these two lines is the size of the dog. M’Loot Malamutes are larger than the Kotzebue’s. In addition, true Kotzebues have only wolf-gray coats, whereas M’Loots come in a variety of colors, including wolf-gray, black and white, sable and white, seal, blue, and white. Kotzebues also tend to be less aggressive than the M’loot, however, they can be more hyper. The Kotzebue line is essentially due to Arthur Walden, and Milton and Eva Seeley. In fact, it was Milton and Eva that got the Kotzebue line recognized and registered by the AKC in 1935. Paul Voelker developed the M’Loot line. Paul did not register his dogs, but he sold them to people who eventually did. Amongst breeders, there is some argument as to which is the “correct” Malamute. In spite of this, Alaskan Malamutes are credited as one of the few breeds that is very close to its original form and function. The Alaskan Malamute is a double coated breed. This coat consists of a woolly undercoat and longer guard hairs. Twice a year, Malamutes “blow” their undercoats, that is, they shed their undercoats completely. It is a very intense shedding period that can last up to three weeks from start to finish. The good news is that this only happens twice a year. The remainder of the time, Malamutes are relatively shed free (unlike smooth coated breeds). The bad news is that the shedding period can be rather messy. The hair comes out in large and small clumps. Lots of vacuuming and brushing are in order. It should be noted that some owners that live in very warm climes, ones that lack “seasonal changes,” report some shedding year round in the breed. The Alaskan Malamute is a very clean and relatively odor free dog. It tends to clean itself like a cat. Even when a Malamute becomes covered in mud, it will clean itself. Therefore, bathing needs are minimal. Some owners only bathe their dogs once a year or less. Other than during coat-blowing season, the Malamute needs very little grooming. No trimming or shaving of hair is required or recommended. An occasional brushing to remove dead hair and keep the coat fresh and shiny is required. Their nails should be checked and clipped periodically. Since they are pack oriented, Malamutes are generally not “one-man” dogs. They are an extremely intelligent breed that can be very stubborn and easily bored. They are not typically recommended to a first-time dog owner as mistakes are easy to make and sometimes hard to correct unless you really know what you are doing. They can be a challenge to train, due to their stubbornness. It is said that to teach a Malamute to do something once or twice is very easy, because they are quite intelligent and quickly learn new tasks. To get them to repeatedly do something over and over again is much more challenging, due to their stubbornness and the fact that they become easily bored. This trait is quite common in all of the northern breeds. The sheer size of the Malamute can become an obstacle to novice dog owners. Many Malamutes end up in the pound and even destroyed because an owner fell in love with the cute puppy but could not control the large, stubborn, powerful adult. Owing to their strong pack nature, Malamutes can be more aggressive towards other dogs than other breeds. Because of this, great care should be taken on the part of the owner to socialize their Malamute puppy as much as possible with other dogs. Due to the character of the Malamute, they should never be actively trained to be protective, vicious, or aggressive. Their very nature makes them lousy watchdogs. It is against their instincts to make them in to watch or guard type dogs. It has been tried in the past with disastrous results. They are a visual deterrent only, as the uninitiated may be hesitant to approach property or family in the company of such a large, impressive looking animal. However, Malamutes are as likely to greet a potential thief as warmly as a trusted family member. This is part of what makes a Malamute a Malamute. It is sort of a soft “woo woo woo” sound. Malamutes can howl the roof right off of your house, however. Owners of multiple Malamutes have noticed that when their dogs howl, they will all stop simultaneously. Again, this behavior is due to the fact that they are a very pack-oriented breed. Note: Those living in Australia should read the note that follows these comments carefully. You should try and follow the puppy’s diet at the time you collect him from the breeder as best you can, until the puppy is settled in to its new environment. Then you can gradually change the diet to suit your preferences. Remember that sudden changes in diet can severely disrupt the puppy’s digestive system and cause gastric distress. Some people prefer to free-feed their dogs, while others prefer scheduled feeding times. Certainly, while the dog is still a puppy, he should be fed three times a day or free-fed. Malamutes are not fully mature until 18 months of age. The diet should be tailored to the dogs level of activity and eating habits. Some Malamute owners have found it impossible to free feed their dogs, due to the fact that some Malamutes will eat all food presented them immediately. This can lead to a variety of health problems, including obesity and bloat. In addition, stool size and the amount is generally less with the premium dog foods. Keep in mind that feeding dogs is partly art, and partly science. The dog food manufacturers have done the science part. The rest is up to you. Some people feed their dogs a mix of canned and dry food twice a day. Others feed only dry and allow free feeding, and so on. Be sure and pick a frequency of feeding, brand, and type of food to suit your dog’s needs. For working Malamutes, something equivalent to a Science Diet Performance is in order. For Malamutes that go for walks and hikes, a Maintenance formula is usually best. Consult your breeder and veterinarian for advice. One other thing worth mentioning here is how long to feed puppy food. Some research indicates that feeding puppy food for too long can increase the incidence of hip dysplasia in dogs that are susceptible to it. Some breeders start feeding adult food very soon. Even though the Malamute is not fully mature until 18 months, most people gradually switch to adult dog food at the 8-10 month time frame. Again, this is something to discuss with your breeder and veterinarian. In Australia, the use of commercial “wet” dog foods as the sole primary source of food has been found to be linked with hot spots and gastric distress (including very loose bowel movements) in many dogs of this breed. Occasional use is recommended. Likewise, kangaroo meat is not recommended. Many breeders make their own dog food and supplement it with a variety of vitamins and minerals to ensure a balanced diet. 6yh n If you live in Australia, it is recommended that you consult with your breeder and veterinarian regarding this issue and monitor the dog’s condition closely with whatever diet is chosen. Alaskan Malamutes are happiest when they can share in family activities. The best arrangement is one in which the dog can come in and out of the house of its own free-will, through a dog door. If a dog door is not possible, then training the dog to go to an outside door to be let out is also very easy to do. Outside, the dog should have a large, fenced yard. The fence should be strong and at least 6 feet tall. It is also a good idea to bury wire in the ground to discourage digging out. Malamutes are notorious diggers. It is usually best to set up a sandbox somewhere in a shaded part of the yard and encourage digging there, if possible. Malamutes should not be allowed to roam around the neighborhood. If one chooses to kennel a Malamute, the kennel should be chain link, with a concrete run, and should be 8 ft wide and 15 to 20 ft long. It should be at least 6 ft high with chain link across the top of the kennel. It should be in a shaded location and have an insulated dog house with a door for shelter from the elements. Because the Malamute is an arctic dog, it can remain outside in very cold weather. However, it should be provided with shelter from the elements in the form of a good sturdy house. 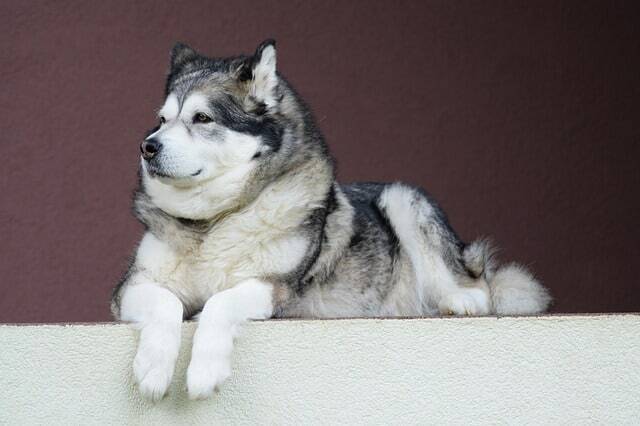 The house should have a flat roof, as Malamutes love to lay on top of their houses and observe the world. A well-insulated house with nice straw bedding is perfect for Malamutes that spend most of their time outside. Heating the dog house is usually not necessary. Training Alaskan Malamutes can be a challenge. With this breed, it is important to start young. Establish rules of the house early, and make sure that the puppy knows that you are in charge. For example, if you do not want the dog on the bed as an adult, do not allow it as a puppy. The rule of thumb is that if you train a dog to do something, expect him to do it. Therefore, if the puppy learns that certain things are allowed, it will be difficult to train them not to do them as adults. Things that are cute as puppies may not be all that cute when the dog weighs 80 lbs or more. Since the dog is pack-oriented, it important to establish yourself as the head of the pack, or alpha, very early. Once you do this, the dog will respect you and training will be much easier. It is best to enroll in a puppy training class (or puppy kindergarten training as they are commonly known) soon after your dog is home and has all of its vaccinations. This training is good for the dog and for you as the owner, as it will help you understand your new puppy and establish you as alpha very early in the puppy’s life, which is extremely important with this breed. This breed is intelligent enough to differentiate situations very well and will apply different rules of behavior for different situations. You must stay on top of the dog and maintain control, which is easier to do while the dog is of manageable size than with a stubborn adult that has been allowed to get away with undesirable behaviors for a long time. It is very important to remember that Alaskan Malamutes are a working breed. They need something to do. Putting them in the backyard and tossing them a bone and expecting them to be happy us a very bad idea. They need a lot of exercise and interaction to be happy. The exercise can come in the form of mushing, which is, of course, best, or can easily be in the form of frequent walks, hikes, and playing. The dog makes a wonderful hiking companion, and with a dog pack, can carry food and water. Snow Nose is described as a pink/reddish marking on the black nose. It is commonly experienced amongst the northern breeds. Snow Nose can disappear over the warmer months and reappear over the winter months. There is nothing wrong with snow nose. Bad pigmentation occasionally occurs within specimens of the breed. The pigmentation area generally occurs around the face and is best described as being pinkish skin and it can, in some cases, detract from the dog’s appearance. The main problem with this pigmentation is the threat of sun cancer occurring to the area as the pink skin is more at risk of sunburn. It is advisable to cover the affected area with sunscreen regularly to protect the dog from this threat of cancer. It is possible to correct pigmentation problems with tattooing and there is a relatively new procedure where a vegetable dye is injected into the area and spread to cover the pigmentation. Hot spots look like raw grazed skin. They can also take the form of a loose coat that does not appear to be attached to the skin. There is a link between hot spots and incorrect diet. Alaskan Malamutes cannot handle rich and spicy food. Bloat is a condition that affects all large, deep-chested breeds. It is a potentially life-threatening condition which usually affects dogs in the prime of life. Basically, the dog’s stomach will swell from gas, fluid, or both (this is acute gastric dilation). Once distended, the stomach may twist abruptly on its long axis. If it does twist, but the twist is less than 180 degrees, it is called torsion. If greater than 180 degrees, it is called a volvulus. Therefore, the term bloat can refer to any of these three conditions (acute gastric distortion, torsion, or volvulus). Acute gastric dilation is not serious and may clear up itself in a few minutes. Torsion or volvulus are life-threatening and immediate veterinary attention is required. The chance for recurrence is around fifteen percent. The cause of bloat is unknown. Progressive retinal atrophy (PRA) and central progressive retinal atrophy (CPRA) have appeared in a number of breeds, including Malamutes. Hemeralopia, or “day blindness”, has also occurred in Malamutes. All of these problems are genetically caused. Careful screening of potential breeding pairs has helped reduce the incidence of these problem in the breed. This is another genetic disorder that affects Malamutes. Simply put, hip dysplasia is a deformation in the hip joint. That is, the head of the femur does not sit solidly in the acetabulum. The joint lacks tightness, and the condition results in a painful and often debilitating life for the dog. Hip dysplasia is considered to be a moderately inheritable condition. Breeders will usually have breeding pairs OFA (Orthopedic Foundation for Animals) certified prior to breeding. OFA certification can be given only after a dog is over 24 months old. This is a genetic disorder in the M’Loot Malamute line. It is also known as dwarfism, although this term is not very descriptive or even entirely correct. The condition results in delayed endochondral bone formation. In 1970, the Alaskan Malamute Club of America officially recognized CHD and began efforts to combat the disease. By the end of that year, it was proven that the gene for CHD was an autosome recessive (through repetitive matings of CHD dogs) and mathematical models one which pedigrees could be tested were established. A Malamute with less than a 6.25% CHD probability factor is considered to be breedable. 6.25% corresponds to one carrier as a great-great-great grandfather. Obviously, this is not foolproof, but the chances of a dog not carrying CHD are improved considerably the lower the number. CHD probability is computed through the average of the two parents. There are various ways to test for CHD including blood tests and x-rays. This recessive gene seems to affect blood as well, producing a type of anemia. X-rays are generally made between the ages of 3 to 12 weeks if one is overly concerned about CHD detection. Most Malamute breeders are satisfied with the CHD rating and no outward signs. Is a Malamute part wolf? No. The Alaskan Malamute is a domesticated purebred dog and has been for many centuries. They are often mistaken for wolves, and they are often used in movies to depict wolves, but they are most certainly not wolves or part wolf. How do they handle the summer heat? Like any dog, to cope with summer heat the Alaskan Malamute needs a constant supply of water to drink and shade from the sun. If the dog is allowed inside then it will find its own cool room (probably on the kitchen or bathroom floor if it is tiled or linoleum-floored). Some dogs like having ice added to their water to help keep it cool. Some also enjoy a children’s wading pool filled with water in the summertime. The Malamute sheds a lot of coat directly before summer, as soon as the weather starts to warm up, which also allows them to keep cool. Heavy exercise should be avoided in excessive heat. Curtail exercise times to be early morning or just after sunset. Once the dog is acclimated to his environment, he is usually fine. Malamutes are remarkably adaptable animals. However, one should never try and push a dog beyond his capability to cope with the heat. To do so can be disastrous. One must keep in mind the type of climate the dog is acclimated for and not look for signs of heat stress. Do not ever lock any dog in a car in direct sunlight, or in the shade for a great deal of time, even with the windows down a little for ventilation the heat generated by the dog is still enough to cause heat stress in summer. What are they like with children? Due to their gentle temperament, the Alaskan Malamute is generally a very good family dog. They seem to enjoy the company of children, though common sense must be used when mixing any dog with young children. They are a very powerful dog and children should not be left in total control of the dog. Alaskan Malamutes are generally patient by nature and will tolerate young children fawning over them, but this should be strictly supervised for the sake of the dog as well as the child. With these caveats in mind, since Malamutes love attention, well-behaved children get along wonderfully with well mannered and socialized Malamutes. What are they like inside a house, being so big? Alaskan Malamutes, aside from the occasional invasion of masses of fur when they are shedding coat, are excellent house dogs. They are extremely clean dogs and surprisingly quiet. They are very sure-footed and in no way clumsy around furniture. They will often pick out a favorite sleeping spot and stay there for hours. Favorite spots seem to be tiled and linoleum floors in warm weather, soft pillows or beds at other times. Most Malamutes love food, however, they eat surprisingly little for their size. The actual amount of food will vary depending on the metabolism and activity level of the dog, and the type of food that is given. A working adult will eat approximately 4 cups of high-density food per day. Other dogs will generally eat less. Puppies require smaller, more frequent meals. How much exercise do they need, and what kind? You should not strenuously exercise a puppy under 6 months of age. Their muscular-skeleto system is not developed enough yet. Their play is enough to keep them healthy. You should play with your puppy and work on some of the basic obedience commands with him, in a playful way. Once the dog is 6 months old, a kindergarten puppy training class or a basic obedience class is a very good idea. It will start you both out on the right foot. You can then more easily start taking the dog for walks in your area on a leash. By the time the dog is full grown, at around 18 months, he will be ready for much longer walks, an hour per day or more. The obedience training will make the walks much more enjoyable. Alaskan Malamutes also enjoy jogging, but this should not be attempted until the dog is 18 months old or older. Hiking, with a dog back-pack, is great fun. One can also bike with a dog, with a nifty device known as a “Springer.” Finally, sledding is an excellent form of exercise and is what the dog was bred for. The sled dog part of the FAQ for rec.pets.dogs cover these things in more detail. Do they pull sleds very fast? The Malamute is a very strong dog, but not as fast as some of the other northern breeds. Malamutes are not as fast as, say Siberians, and because of this are not typically used in sprint sled racing or a race like the Iditarod (although they sometimes are). Endurance and strength are the Malamute staples, and they are frequently used for exploratory trips across the North Pole or Antarctica (most recently, in the Trans-Antarctic expedition) and in weight pull competitions. The Malamute is a very strong dog. They were originally freighting dogs and as such, are able to pull tremendous amounts of weight. Just from looking at the Malamute, and the size of his bones and his stature, it is easy to see that they are indeed very strong animals. For this reason, many people use them in weight pulling competitions, where they will pull thousands of pounds. Malamutes blow their undercoats twice per year. They do not typically shed year round like many dog breeds. When they do blow their coat, they lose lots of hair (several grocery sacks full per week). Do they like to fight other dogs? No. Malamutes are very pack oriented dogs. As such, they communicate with other dogs in a variety of ways. An ill-mannered, aggressive dog is not a good team dog and therefore not a good sled dog. However, poorly socialized and trained Malamutes can be aggressive towards other dogs. For this reason, it is very important for a Malamute owner to train the dog carefully and make sure to properly socialize it with other dogs. I’ve heard Malamutes are dumb. Is this true? No! Alaskan Malamutes are extremely intelligent working dogs. People often mistake the fact that they can be difficult to train as a sign of stupidity. Malamutes are very clever and easily bored. The key to training them is to keep them interested and to challenge their intelligence. A Malamute probably knows what you want him to do, he just may not want to do it! Just how cold can an Alaskan Malamute live in? Alaskan Malamutes can work and live in extremely cold conditions, approaching 70 degrees below zero.